Post 91 was started by a group of 20 Berea Veterans and was granted a charter on September 5th, 1919. The founding fathers named the Post after Lt. Albert E. Baesel, a Congressional Medal of Honor recipient who was killed in action during World War I. It seemed fitting that the name would honor a Berea Veteran. The first Post 91 was located on Front Street where the Public Library now stands today. The property was traded to the City of Berea for our current location on Coe Lake. Over the years our Post has gone through many changes. Our current home was built in 1955 and renovated several times over the past 30 years. During the 90s the City of Berea officially renamed our Adams Street address to American Legion Parkway. On Memorial Day 2005, the drive way in front of our Post, was renamed Albert E. Baesel Drive by the City of Berea. Post 91 continues to be a leader in the community providing volunteer services for Berea and outlining cities. Who Was Albert E. Baesel? 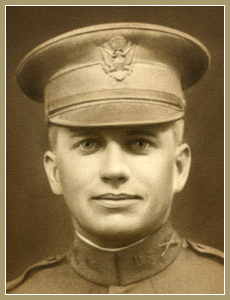 Albert E. Baesel was a Second Lieutenant, from Berea, Ohio, during the First World War. He was killed in action in Ivoiry, France on September 27, 1918 and was awarded the Congressional Medal of Honor for his bravery in 1922. He was the first World War I soldier from Ohio killed in action. His company fashioned a grave using a mess kit as a digging tool, constructed a cross from tree branches tied together with boot laces, and attached one of Baesel’s ID tags to it before departing. On September 5, 1919 the American Legion Post 91 Congressional Charter was issued, in honor of Albert E. Baesel. In early 1926, French farmers plowing for unexploded artillery projectiles, discovered Baesel’s grave and notified authorities. Within a short time Baesel’s remains were returned to Berea for proper burial. Today he is buried at Woodvale Cemetery located in Middleburg Hts, Ohio. Post 91 is dedicated to assisting our fellow veterans with benefits, employment, health care, moral support, burial services, and financial assistance. Post 91 is involved with several programs. Each year Post 91 donates its time and funds making Post 91 a leader among non-profit organizations in the local community. Our Post offers 4 scholarships for local college bound students. To learn more about Scholarships, please call our Post at 440-234-0091. Our Post serves as sponsor of the Berea’s Memorial Day activities. We, along with the citizens of Berea, join together on this day to remember loved ones who has passed on, as well as remembering our service men and women. Parades and dedications of memorials are part of the day’s activities. Our Color Guard leads the parade accompanied by the Berea City Council, Boy Scouts, Girl Scouts, Berea High School marching band, members of the armed forces, Berea Fire & Police Departments, and numerous clubs and orders. Following the parade is a remembrance ceremony attended by the Mayor, representatives of Post 91, Color Guard, Berea High School marching band, and honored speaker. Post 91 also takes part in Berea’s patriotic holidays including Independence Day, POW/MIA Recognition Day, Veterans Day, Patriots Day, and Flag Day. Post 91 is host to many special events, holiday parties, and fundraising activities.